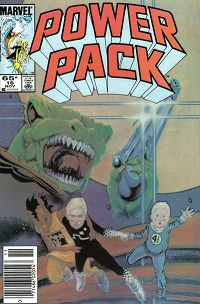 1985 is a beautiful year for creative teams. John Buscema and Tom Palmer join Roger Stern's already awesome Avengers and make it super-awesome. 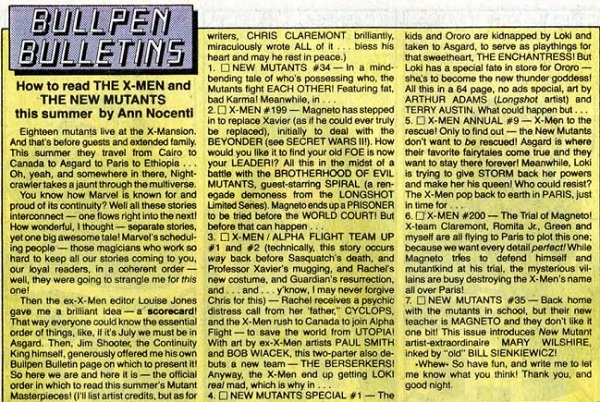 Claremont & John Romita Jr. continue on X-Men. 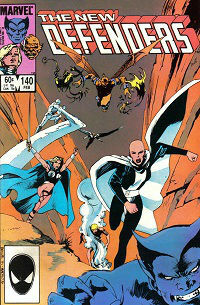 John Byrne and Walt Simonson continue their fabulous runs on FF and Thor, respectively. Jim Owsley's Power Man & Iron Fist hits its stride, and Owsley as editor ensures continued quality of the Spider-books, including the famed Spidey vs. Firelord story and the debut of Peter David. O'Neil/Mazzucchelli Daredevil, Peter Gillis' Defenders, Louise Simonson's Power Pack, Roger Stern's Doctor Strange... all great. There's a few other smaller scale events this year as well. ROM's final battle with the Dire Wraiths involves most of Earth's heroes and has a tie in with Fantastic Four. FF and the Avengers have a crossover event in their annuals, as do X-Men and New Mutants. The aforementioned Firelord battle ties-in with the Avengers. All of these events (including Secret Wars II) represent an increase in formal cross-title interaction after the success of Secret Wars and Thor's Casket of Ancient Winters saga from last year. Marvel seems to have been unprepared for the degree of coordination that was required for all of these events to occur, however, as virtually every one results in chronology problems. 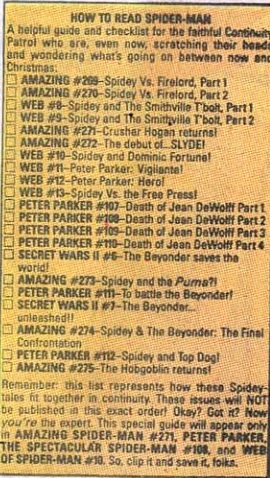 Both the X-Men and Spider-Man Editors present reading order lists this year, which shows both how complex the franchises have become but also that Marvel was still dedicated to sorting out how it all takes place, in contrast to today's books. I should note that neither my project nor others like the Marvel Chronology Project take these types of list as gospel due to various problems (such as the placement of that X-Men/Alpha Flight series); it's probably also why Marvel eventually stopped trying. The Flexographic process involved using water based ink instead of oil based ink and resulted in much brighter colors on the same paper. Several problems were immediately apparent. First, the brighter coloring made it clear how poor the separation work was, especially registration errors. Second, the rubber plates used had a much shorter lifespan than the previous plates did, resulting in really bad printing at the end of the print run. Third, the bright colors were really bright, making many books look like your little brother had attacked them with his Crayolas. In other creator news, Steve Englehart returns to Marvel, and launches an ongoing West Coast Avengers series as well as a Vision & the Scarlet Witch 12 issue maxi-series. Mark Gruenwald begins his long run on Captain America. And the entire creative teams of Hulk and Alpha Flight switch titles. Cover prices go to 65 cents early this year (Apr cover date). Prestige books are 75 cents, and annuals are $1.25. The Thing returns from the Secret Wars Battleplanet, but wanders the country instead of joining the FF. A new, less disco, costume for Dazzler. The Vision tries to take over the world, and is rewarded for it by getting his own book with the Scarlet Witch. The Serpent Society forms, led by Sidewinder and consisting of a number of existing snake themed super-villains plus some new ones, notably Diamondback. The Baxter Building is destroyed when Dr. Doom's replacement, Kristoff, launches it into space. The Savage Land is destroyed. Tony Stark returns to the Iron Man armor, in his red & silver suit. Susan Richards makes the long overdue name change from Invisible Girl to Invisible Woman. All Skrulls lose their shape-shifting ability. The Hulk returns to Earth. Dani Moonstar joins the Valkyries. Marvel Team-Up is replaced with Web of Spider-Man. ROM annual #3 Brandy Clark loses her Starshine powers. Captain America #302-304 origin of Captain America's shield. Dazzler #38 Dazzler gets a new costume. Avengers #256-257 1st Nebula. Savage Land destroyed. 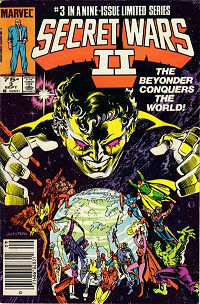 Doctor Strange #71-73 Clea becomes ruler of the Dark Dimension.